I have been an avid home cook for more years than I care to count. 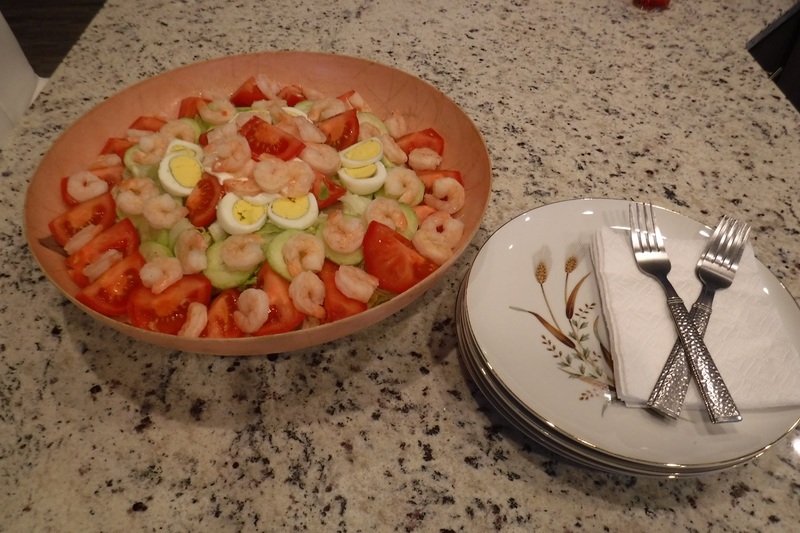 As a pre- and early teen, my first signature dish was this shrimp salad. Each time I made it during the first few times, I made slight changes, always seeking to make it better. Soon I had my recipe established and it has remained unchanged for over 50 years. I didn’t think of it at the time, but my playmates paid me high compliments. Today I am still slightly amazed that a bunch of my fellow moppets just in from a stint of sand-lot baseball would request I make shrimp salad for an afternoon snack. Prepare hard boiled eggs and chill in refrigerator. When cold, peel and slice with an egg slicer. Discard (or save for other purposes) the whites of egg that do not have yellow yolk showing. Peel cucumber and slice into rounds. You will need the same number of cucumber slices as you have egg slices. Open cans of shrimp and drain but do not rinse. You want them just damp with the packing liquid. Peel loose leaves off heads of lettuce. You want firm hearts to cut into bite-sized pieces that stay together. Cut heads into slices then across slices to make bite-sized pieces. Place lettuce pieces in salad bowl, salt lightly and gently toss. Gently shake bowl to level surface of lettuce. Scatter the drained shrimp over the top of the lettuce bed. Sprinkle with fresh ground black pepper. Snip vine end off of tomatoes. Quarter tomatoes lengthwise. Reserve 8 tomato quarters. Arrange the remaining quarters evenly around the edge of the lettuce, like spokes in a wheel, lying on cut side, curved skin sides all facing the same direction. Arrange the cucumber and sliced hard boiled egg slices, slices slightly overlapping, in a circle inside the circle formed by the tomato quarters. Mix 1000 Island dressing and mayonnaise together. Spoon the mixture onto the center of the lettuce bed. Arrange the reserved 8 tomato wedges evenly around the dressing. Sprinkle all over with a light dusting of paprika. Chill well before serving. The salad is ready for presentation. Toss at the table just before serving. Our parents and adult family made salads. 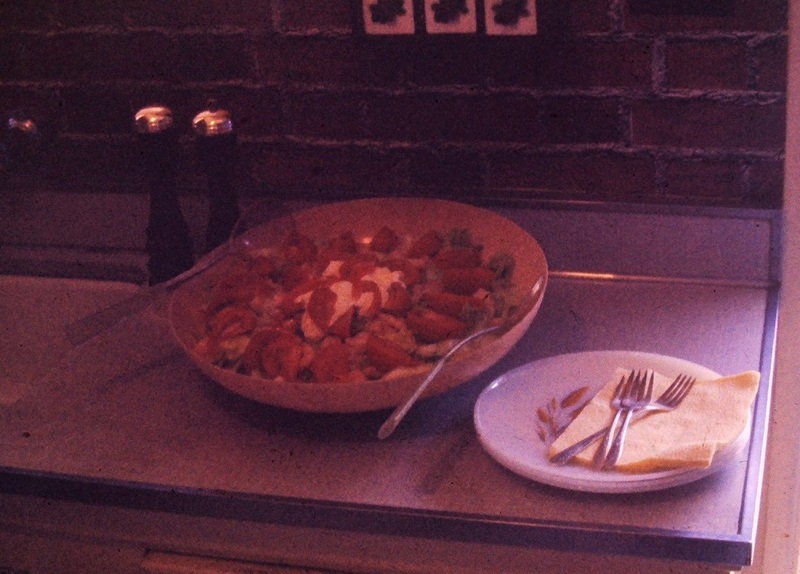 We had salads frequently with our meals. Those salads could be described as “busy;” lots and lots of ingredients. That wasn’t a problem, after all, lots of good stuff makes for a nice interesting salad. The problem was that adult tastes directed the selection of ingredients and those adults sometimes forgot that small kid tastes were a whole lot different. As a kid I had trouble with all the raw onions, radishes, pickled hot peppers and a lot of other things that our parents put in the salads. When I decided to make my own salad, I decided on simple and to include only things I liked. I didn’t want a vinaigrette-style dressing. I wanted a smoother dressing, like the mayonnaise but with a bit more flavor. I had considered 1000 Island but I didn’t want a dressing that would overpower the shrimp, which is really a very mild flavor. So I made an almost 1000 Island, I mixed equal amounts of mayonnaise and 1000 Island dressing. I had more flavor, some added color but the flavor of the shrimp still came through. My next addition to the salad recipe was cucumber slices and chopped hard-boiled egg. I liked the cucumber and it stayed. I liked the egg but didn’t like the little bits of chopped egg. I next sliced the egg, discarded the white slices without any yolk showing. I liked the larger pieces, the round slices of the hard-boiled egg, while eating the salad and I liked the look of the salad’s presentation with the circle of egg slices. That is pretty much how the salad recipe has stayed all these years. Once I did add some croutons. True to my finicky nature, I sometime liked them and sometime not (perhaps because the croutons got mushy when there was left over salad). So, if I’m going to include croutons with the salad, I serve them on the side. The diners can add them if they wish. Although the recipe has remained unchanged, that doesn’t mean that there haven’t been some substitutions at times. *In the fifties and sixties about the only source of cocktail shrimp in our local area was in cans. Canned shrimp was and is expensive. If you are lucky enough to have a seafood counter in your local supermarket, cocktail shrimp on ice is about half the cost of the canned shrimp and is a perfect substitution. Crab meat, real or pollock surimi, replacing all or part of the shrimp, makes a wonderful crab or seafood salad. I hope you enjoy this shrimp salad as much as I have over these many years.